Sometimes Oatmeal is more than oatmeal. Sometimes Oatmeal is love. When my dad was dying, after the treatments stopped and he was home with hospice checking in weekly, oatmeal was his daily breakfast. He prepared his giant bowl himself then sat in his recliner in the dining room to eat while family life swirled hectically around him. And then one day he couldn't. He couldn't handle being on his feet long enough to make his own oatmeal anymore. I was there--having left my family behind to fend for themselves on the other side of the globe--to help out for a couple weeks and spend precious time with dad. I also ate oatmeal every morning for breakfast so the job of making dad's oatmeal fell naturally to me. I was very bad at it. Dad wanted his oatmeal just so. 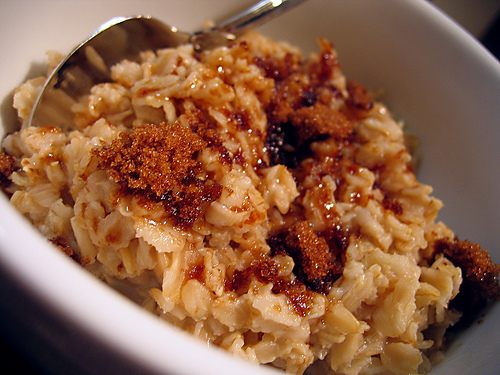 The proper proportions of oatmeal, water, raisins, and brown sugar were apparently essential as was the exact order they were added to the bowl, how they were stirred and the precise amount of time in the microwave. And of course which bowl and spoon were critical as well. Dad would sit in his recliner and call out directions to me in the kitchen to make sure I did it right. I never once got it exactly right. Although he always thanked me for making his oatmeal, he always let me know which elements I had gotten wrong. And the thing is, I didn't mind. I knew he wanted to be in the kitchen making his own oatmeal. He wanted to be still providing for his family as he had done for so many years and not have them wait on him. He wanted to be healthy. He wanted to live. Ironically, shortly after I returned home to my own family, my brother stopped by to visit with Dad and in his email update he sent to us siblings scattered far and wide he included this line: "Mom made his oatmeal (according to Dad, only Mary can do it just right ... but Mom is second best)"
I laughed and then I cried. Because for me making that bowl of oatmeal every morning, criticisms and all, was a joy and a pleasure. I was so grateful for the pleasure of being able do something, anything, to serve my father. For me that morning oatmeal wasn't just oatmeal it was love. When Mom called and said Dad couldn't eat his oatmeal any more I knew it was time. I packed my bags and left my family behind again--this time with an open ended ticket.